Is it that I have extremely good luck with restaurants in Jersey City’s Little India or are they all that good? I often say that if I had to go vegetarian for the rest of my life, I’d make a beeline for Indian food and never look back. Not that there’s anything wrong with straight ahead salads and bespoke medleys, but the sheer number of herbs and spices endemic to the cuisine in so many complex permutations and combinations coupled with its variety of cooking styles affirms that I’d never want for variety. Everything we ordered at Chutney’s, an exclusively vegetarian Indian restaurant at 827 Newark Avenue, Jersey City, was delicious. 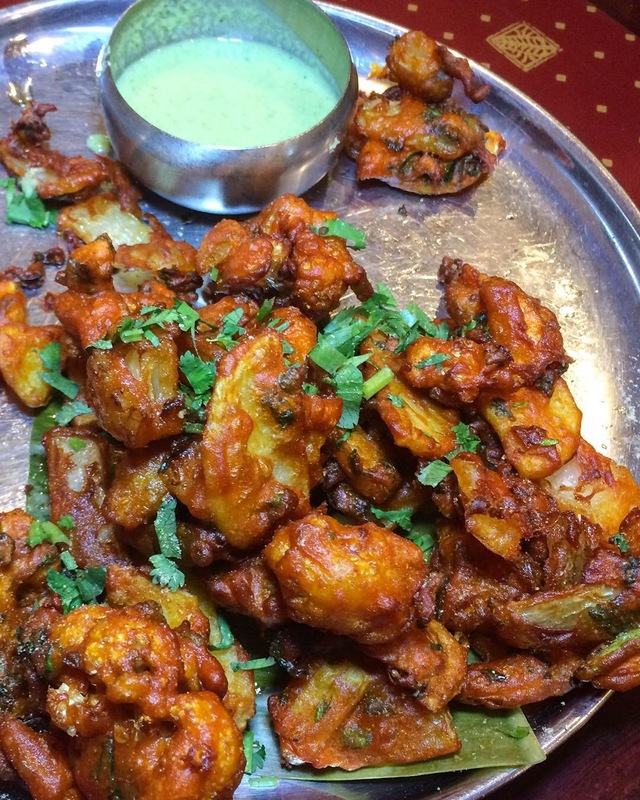 Crispy Fried Vegetables, lurking in the Appetizer section of the menu, not under Pakoras, were marinated with herbs and spices and deep fried; they proved to be an excellent starter. Mysore Bonda. 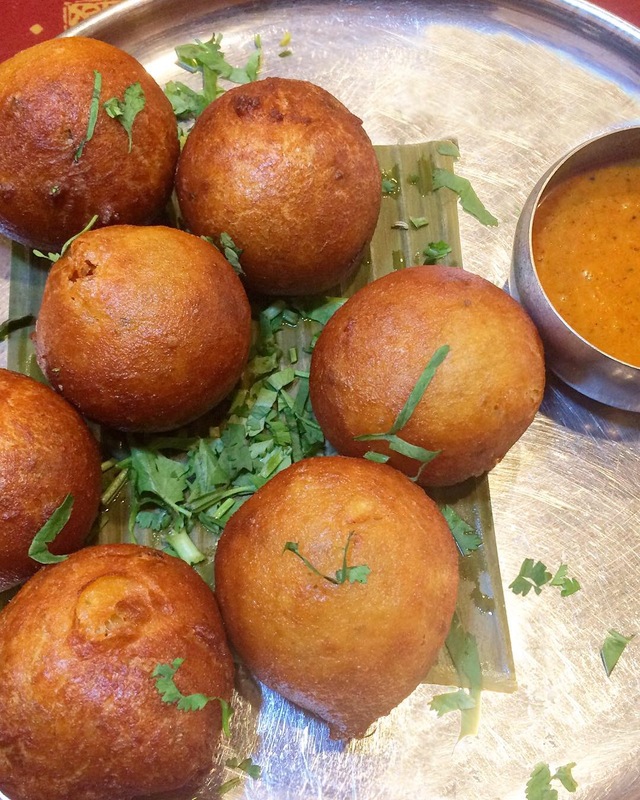 Mysore is a city in South India; bonda is a South Indian snack made from flour and buttermilk, the flavor of which came through brightly in this light treat. 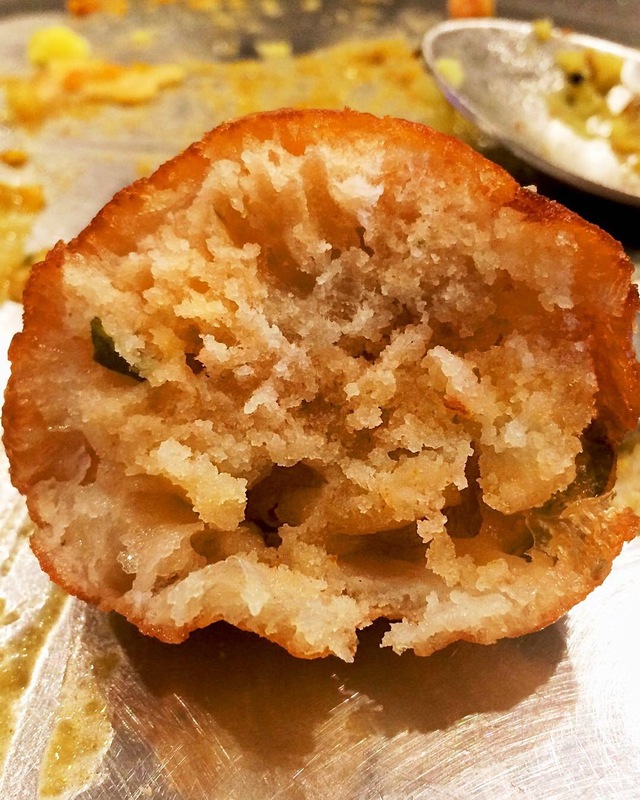 Bisected mysore bonda. Do I need to tell you that they offer over 11 kinds of chutneys not to mention sambar, rasam, and other dipping soups and sauces? More to come from Chutney’s…. This entry was posted in Instagram, Restaurants & Food Courts and tagged Indian by Rich. Bookmark the permalink.